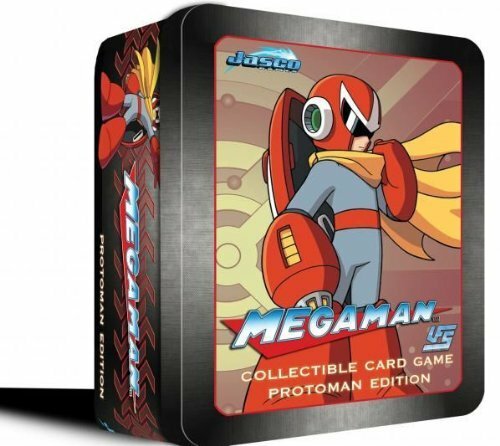 UFS Protoman Collector's Tin - Cards worth collecting — GamingWithSwag.com - Dads By Day, Gamers By Night. Today I received a Collector's tin of the Mega Man Universal Fighting System (UFS) Protoman card starter set http://amzn.to/1gmfgUo. Prior to this, I have never heard of the UFS before but apparently it is quite popular, and other video game licenses have been adapted in this format. It's a similar game to Magic or Pokemon, where deck building and turn-based play is involved. I jumped on the collector's tin, as it has a Protoman Starter Set, 3 booster packs, a bonus 3-card Robot master pack, a play mat, and instructions. The retail price of a starter set 2-pack is $30.00 alone, so this makes a great value. The cool part is you can mix and match your decks from other UFS card series and build a deck that is very unique for when you play your friends. The cards are absolutely beautiful, and are based on the hit comic series. The art is very well done, and the cards seem to reflect the characters and their move sets appropriately. I also purchased the Mega Man Collector's tin which is on the way. (future review to come) I am looking forward to collecting more booster packs, especially with the wide array of characters in the Mega Man universe.